at different hospitals and clinics assigned by the instructor. Tuition: $760 (may be paid by your employer). Minimum of 10 students for course to be offered. 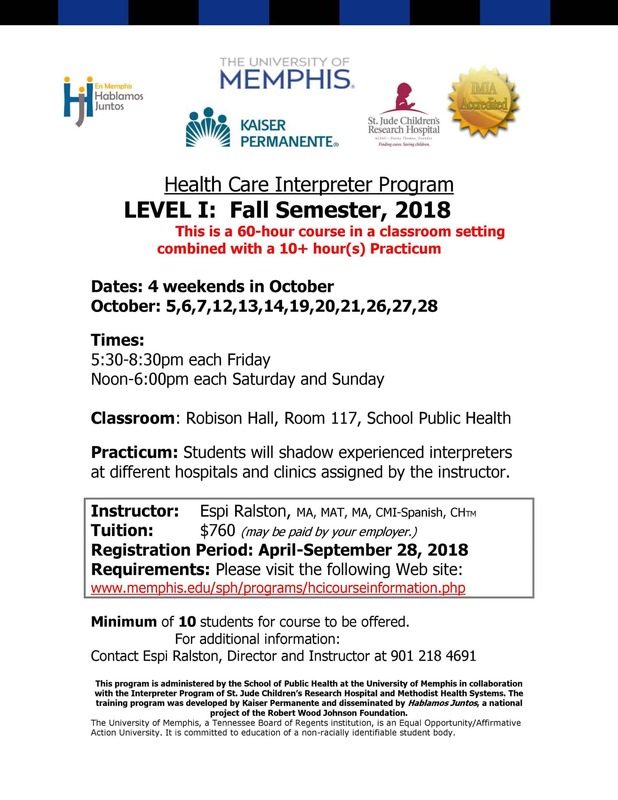 This program is administered by the School of Public Health at the University of Memphis in collaboration with the Interpreter Program of St. Jude Children’s Research Hospital and Methodist Health Systems. The training program was developed by Kaiser Permanente and disseminated by Hablamos Juntos, a national project of the Robert Wood Johnson Foundation.The University of Memphis, a Tennessee Board of Regents institution, is an Equal Opportunity/Affirmative Action University. It is committed to education of a non-racially identifiable student body.